This afternoon I am trying the Consecrator Dopplebock from Bell’s Brewery in Kalamazoo, Michigan. This 8% beer is another newly available in Iowa thanks to the recent legislative change. 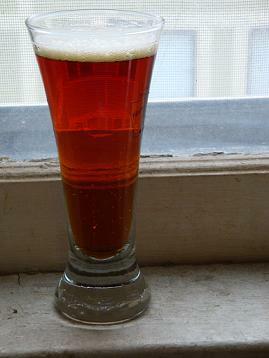 This copper-colored lager has a creamy tan head that slowly fades away. The nose is light but complicated. There is a general malty sweet aroma of caramel and dark fruit. This is accented by a sharp spiciness from the hops and hints of alcohol. Consecrator has a thick malty flavor with a serious hop balance. The malt is caramel sweet with toast and brown sugar. There is a flavor that borders on smokiness, reminiscent of rye. The sweetness is balanced by an earthy hop bitterness. Noble and grassy hop flavors are significant but subtle, if only due to the strength of the other flavors. The palate is strong enough to carry the flavors, but perhaps a bit thick, coating the mouth just a little long. An impressive beer. Balanced in every respect, with many intriguing flavors. Most frustratingly, the article quotes the head brewer of BrewDog saying, “There’s no way someone can drink 20 a night. It’s probably the least economic way of buying alcohol. You can get a bottle of vodka for £5.” Somehow they just ignore this perfectly reasonable, well-articulated point. Because it is so eloquent I will just quote entirely the last two bullet points (emphasis mine). * Building on these points, Saturday’s Independent demonstrates breathtaking hypocrisy which does a disservice to its readership. The magazine carries its usual page of wine hagiography (funny how you hardly ever feature beer in this way, even though a cursory look at TGI readership data would show you that your readership are enthusiastic consumers of quality beer). This week Anthony Rose talks us through Italian whites. In total 18 different wines are given enthusiastic endorsement. There’s not even a single mention of the alcohol content of any of these wines. And yet I can promise you that every single one of them has a higher ABV than any of the “mindblowing” beers in your extreme beer article, three of which are illustrated with alarmist starbursts drawing attention to their alcohol levels – levels that are so low that if wine was to be produced to that strength, EU law would prevent it from being called wine because it would be too weak. * But it gets better. In the main paper, 24 pages after the “extreme beer” feature, there’s an article entitled ‘War of the rosés’, about a scheme to make French rosé wine more popular. Here is a direct quote from that piece: “If we are forced to put the word ‘traditional’ on our bottles, people will think, especially young people, that it is a fuddy-duddy wine, an old-fashioned kind of drink. That will ruin everything we have achieved.” That’s from a winemaker. And here’s the journalist himself: “Young people, especially, have taken to rosé as a fun drink, which is refreshing, uncomplicated and relatively cheap. (Anjou rosé sells in the UK at between £5 and £8 a bottle. Other French rosés sell for as little as £3 a bottle. )” Despite the clear admission that rosé winemakers are targeting younger people, despite the fact that rosé wine is being sold cheap and marketed in a contemporary fashion in order to lure these drinkers, there is no worried quote from Alcohol Concern. No sensationalist headline. No mention of the ABV of rosé wines. The attractive illustration of three glasses of rose – unlike your illustration of extreme beers – carries no bold starbursts. The inference is clear: when winemakers admit that they are selling cheap wine (12-14% ABV) and actively targeting young people with 750ml bottles for as little as £3, that’s OK. But when a brewer creates a beer (6-12% ABV) and sells it in a 33cl bottle that retails from £4 upwards, and tells you it is emphatically NOT targeting young drinkers, you run the piece with a ‘health fears’ headline and a subhead that claims the beers are, in fact, targeting younger drinkers – despite the fact that this is a lower ABV drink, being sold at a higher price. Independent, you just got lawyered. The article doesn’t seem to take a position but what do you expect from the Reggie?